Range: Found throughout the eastern three-quarters of Kansas; absent from extreme southeastern Kansas and the High Plains except along the aquatic corridor of the Arkansas River valley. Description: Harmless. Rough scales. 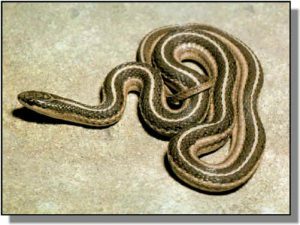 A small reptile, often mistaken for a Garter Snake because it has three dorsal stripes down the body. Unlike Garter Snakes (and the Western Ribbon Snake), the Lined Snake has a double row of black spots down the middle of the belly. Young look like tiny adults. Habits: Active from April to October; prefers to stay beneath rocks or debris on the hillsides of open prairies and woodland edge, but can often be found beneath trash in the middle of small towns and cities. Breeding occurs in both spring and fall; from 2-12 young are born in August. Feeds on earthworms.